The morning of the first game of the MLS Western Conference semifinal series between the Sounders and FC Dallas last Sunday, a pair of combatants met up for breakfast. Dallas technical director Fernando Clavijo sat across the table from Seattle coach Brian Schmetzer, who was still a few days away from shedding the interim tag from his title. Clavijo actually gave Schmetzer his start as an assistant for the indoor soccer Seattle SeaDogs in the mid-1990s. Ever since, the two former colleagues have made a point of meeting up every time their respective teams cross paths, at the very least for a cup of coffee. They talk about everything but the task at hand. These meetings have taken on an added poignancy ever since early 2014, when Clavijo had a rare form of bone-marrow cancer diagnosed. This past January, he announced that he’s in full remission. Still, there is an underlying sense of mortality to their talks now. These meetings also have a tendency to ground both men, mutual touchstones of simpler times. In the press box at halftime of last Sunday’s match, Clavijo marveled at how much Seattle has transformed as a city in the years since he left. He shook his head at just how far he and Schmetzer have come in their respective fields, too. His meetings with Clavijo and their greater significance tell one story of Schmetzer’s career, humble beginnings and lasting bonds. Below are four others that have shaped the newest full-time head coach of the Seattle Sounders. Majority Sounders owner Adrian Hanauer was kidding — he was still basking the glow of the Schmetzer announcement on Wednesday night — but he was referencing a true story. In early 2002, Hanauer was the newly installed managing partner for a minor-league club in the process of steadily hemorrhaging money. Hanauer was also in the market for a new head coach. He was still a relative outsider to the tight-knit Seattle soccer community, but one name kept popping up. 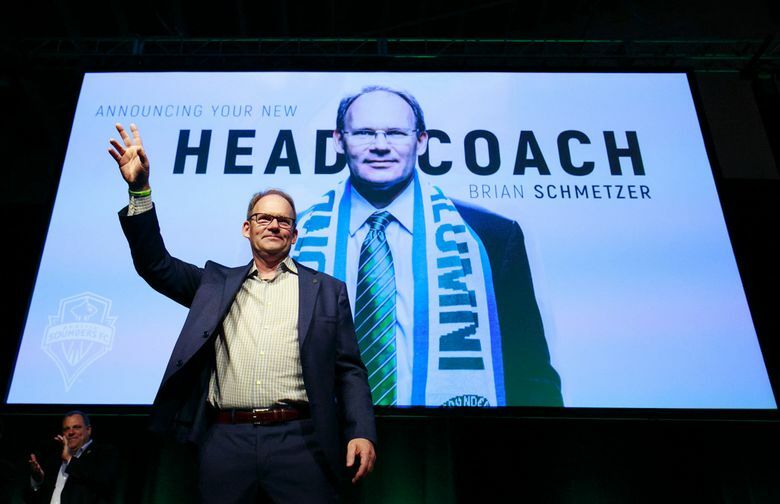 Brian Schmetzer was then coaching youth teams when not running his local construction company. Hanauer left him a voicemail, introducing himself and saying only that it was about the Sounders. Schmetzer figured it had something to do with the soccer camps he’d been running with his brothers, no biggie. The missed call slipped his mind until the following morning, when Hanauer doubled back to pitch a meeting at a local coffee shop. Sure, Schmetzer said, unwittingly delaying his own job interview, but I have to drop off my kids at school first. Off-the-cuff, Schmetzer walked out of that Capitol Hill coffee shop having nailed the interview that would dramatically alter the trajectory of his career. Alan Hinton didn’t just threaten to rip up Schmetzer’s pro contract. The coach of the NASL Sounders pulled out the paper copy of the deal from a nearby file cabinet, pretending to tear it in two for emphasis. Schmetzer had just turned 18 years old that summer, a recent graduate of Nathan Hale High. The ink on his contract was so fresh it might as well have been wet. The rookie midfielder sat in Hinton’s Pioneer Square office next to his father, Walter, wishing he were anywhere else in the world. He saw the police cruiser out of the corner of his eye shortly after the cop had spotted him, turning quickly down a side street before flashing lights appeared in his rearview mirror. Schmetzer wasn’t cited, or charged. He was let off with a warning. “It was a big mistake,” Schmetzer said. “My dad looked at me and said, ‘You don’t know how lucky you are to be a professional soccer player.’ From that moment on, I said that I’m not going to mess this up. A central tenet of Schmetzer’s coaching philosophy is an open line of communication. Shortly after taking over for Sigi Schmid in late July, he gathered his veterans together, making them a straightforward promise: Every time he made a significant lineup change, he would first bring that player into his office to explain the coaching staff’s collective rationale. Those conversations haven’t always been easy. Roman Torres had rehabbed for more than 11 months to return from his knee injury. The hulking Panamanian defender was supposed to get a few minutes against Houston in August, but a late deficit forced Schmetzer to sub on an attacker instead. Up next was the match at Portland’s Providence Park, and the staff was wary about Torres making his first start on artificial turf. Have fun explaining that one, coach. Torres eyes started to bulge. He puffed his barrel chest out, sitting up straight in his chair and pleading with his new coach to let him play. “And I’m going – this is a critical moment for me, because I have to show strength,” Schmetzer said. Another test: A disgruntled Nelson Valdez sitting in his office a couple of weeks later. Though the Paraguayan had started Schmetzer’s first match as interim coach, a home draw against Los Angeles, Valdez was the odd man out of the starting XI as the team gathered momentum down the stretch. Valdez heard that pledge to explain lineup changes to the veterans. He hadn’t been given an update on his standing in over a month, and the 32-year-old forward voiced his displeasure. And yet those paled in comparison to Schmetzer’s primary task as interim head coach: Winning over Clint Dempsey. “It was significant in the sense that he is our best player,” Schmetzer said. “You could argue between Nico (Lodeiro) and Clint, but those two guys are a little bit above. We have some good pros, but let’s be honest. Clint had been here for two-and-a half-years. So he was actually, you know, the big dog. Dempsey heard him out, face impassive. It was unclear, that day, whether the message had resonated. But something must have clicked: In the four matches before he was ruled out for the season with an irregular heartbeat, Dempsey scored five goals. The team, as the coach had hoped, followed the lead of its highest-profile player. “That conversation was certainly a big one, but it was a lot easier than people might expect, because Clint is fully a team guy,” Schmetzer said. “It wasn’t like we had this long, drawn-out, tense meeting. It was open. He was open to hear from me and I am open-minded enough to listen to some of the older players. The first few days of Garth Lagerwey’s tenure as Sounders general manager and president of soccer in Jan. 2015 were a blur of faces and names. He met with staff, one by one, processing their backgrounds and hopes for the future of the club. There was one meeting, in particular, he was looking forward to. Schmetzer, Schmid’s top assistant, was a direct link to the Sounders’ NASL era, to their minor-league one, to the blank space in between. Lagerwey desperately wanted to get a grasp of how that past had shaped the club’s present. Schmetzer told the Chicago native of the heady days following the club’s founding in the early ’70s, how those players went above and beyond to establish a lasting connection with the community, how a few true believers kept the flame alive after the NASL went defunct. He told him about the USL club, the financial struggles, about how Hanauer over-delivered on his promises to take care of the players who took pay cuts in other ways, how that had cemented his bond with the owner. “It was kind of a history lesson, I guess you could say, to give Garth some context and depth to the job he was about to take on,” Schmetzer said. Periodically, Lagerwey would check in, using Schmetzer in the way a traveler might lean on a fixer in a foreign land. Why are the fans reacting to this specific decision in this specific way? How might this be explained by the club’s history? Those meetings forged a relationship that has come to the fore in recent months. The dynamic changed, of course, when Schmetzer got the bump up to the interim coaching role. Their chats were suddenly more immediate, restricted to the business of saving what at one time appeared to be a lost season. And yet asked on Wednesday night how Schmetzer had convinced him that he was the right man for the job – besides the on-field success – Lagerwey reflected upon the reason why he so looked forward to that initial meeting with Schmetzer in the first place.